Why is he making such dire predictions? He explains ...the most important mobile heat sinks on the planet are the oceans. As the greenhouse effect from elevated CO2 has increased, the oceans have absorbed more heat. Elevated sea temperatures are the chief cause of severe coral reef bleaching events around the globe but that is not the worst of it. Ecosystems can recover from all sorts of abuse, and coral reefs are no exception. 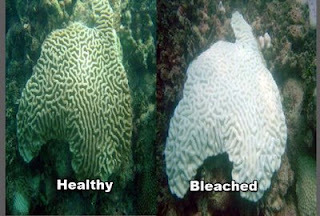 Good recoveries from bleaching have been observed, provided that further events do not occur while the ecosystem is re-establishing. Unfortunately, there are no signs that greenhouse gas increases are moderating, and so we can assume that the frequency and severity of bleaching events will continue to increase — on our present course, the worst bleaching year we have had to date will be an average year by 2030, and a good year by 2050. Ocean and atmospheric rises in temperature are also predicted to increase the severity of cyclones, which will add an extra burden on the recovery process. ...there is a much more serious crisis on the horizon — that of ocean acidification. This will not only affect coral reefs (although reefs will be hit particularly hard), but will impact all marine ecosystems. The ultimate culprit is still CO2 but the mechanism is very different. So while they are fiddling in Cancun over detail and process and essentially avoiding doing anything concrete -- this is supposed to lay the foundation for action next year.. maybe! -- there is the very real danger of the all coral reefs disappearing from the Earth in our children's lifetime. An entire marine ecosystem that supports 25% of all life in the oceans are on the verge of collapse and no actions are being undertaken. And following the collapse of coral reefs ...other great ecosystems of the ocean stand behind reefs like a row of dominoes. If coral reefs fail, the rest will follow in rapid succession, and the Sixth Mass Extinction will be upon us — and will be of our making. Go read the whole article for yourself and decide how long you can put off working to elect people who will take action. It's obvious at this point that Canada will not lead on the issue of Global Warming so long as the Tories are in power.